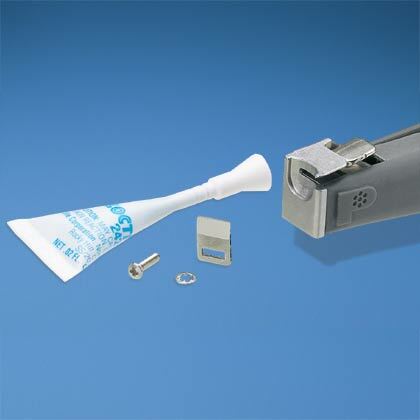 GS4H metal tool is designed to ensure safety, increase productivity and lower installed costs! Panduits ergonomic metal installation tool is the perfect solution for any cable tie tensioning and installation in any warehouse, maintenance, military, construction or repair application. GS4H model is designed to be user-friendly with no maintenance required and comes with a 20 year manufacturer warranty to protect your investment. In addition, all Panduit products are manufactured and registered as ISO 9001:2000 quality certified so you know you are always purchasing top of the line products with Panduit. 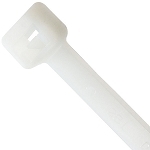 This GS4H cable tie tool is qualified as Military Specification Standard Part # MS90387 and MIL-T-81306A to meet your requirements to install the following military standard straps: MS -3367-1, -2, -3. -6, -7, -23, -24, -25, -29 and MS -3368-1, -2, -3, -4. Panduits GS4H allows you to speed up your installation without sacrificing accuracy by installing multiple types of cable ties for complete versatility including cross-section, standard, heavy standard and light heavy cable ties. Tension controlled tool tightens cable ties and cut off any excess using preset tension on the selector knob for a flush cut. Cable tie installation tool design includes a powder coat finish and red trigger handle and selector knob for a professional and clean look. 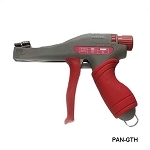 Please click the "More Information" tab for Panduit GS4H Cable Tie Installation Tool Specifications, a Panduit cable tie gun comparison chart, and a manual for installing the replacement blades. Hand Operated Tool, Replacement Cutter Blade, Replacement Tension Gripper and Cut-off Accessory.